- CHIKARA Tag World Grand Prix '06, Night One (February 24) = Delirious & Hallowicked defeated Crossbones & Rorschach and Up In Smoke in the first two rounds of the Tag World Grand Prix Tournament. Delirious was a substitution for an injured UltraMantis Black. - CHIKARA Tag World Grand Prix '06, Night Three (February 26) = Delirious & Hallowicked took down Team DDT (KUDO & MIKAMI), then fell to the eventual winners, The Kings of Wrestling, in the Tag World Grand Prix Tournament. - CHIKARA Sand In The Vaseline (April 21, '06) = Incoherence (Delirious & Hallowicked) won, via DQ, over The Kings of Wrestling. 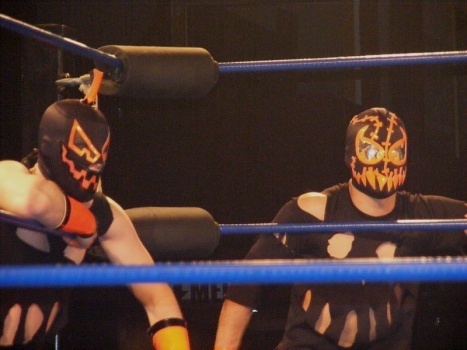 - CHIKARA Aniversario Epsilon (May 27, '06) = Incoherence (Delirious & Hallowicked) defeated Max Boyer & Jagged. - CHIKARA Young Lions Cup IV, Night Three (June 25, '06) = In a non-tournament match, Incoherence (Delirious & Hallowicked) fell to The Iron Saints. - CHIKARA Return Of The Son Of The International Invasion Of The International Invaders - Second Stage (August 20, '06) = Incoherence (Delirious & Hallowicked) lost to F.I.S.T. - CHIKARA From Zero To Hero (And Castagnoli) (November 12, '06) = Incoherence (Delirious & Hallowicked) beat The Colony (Fire Ant & Soldier Ant), then fell to eventual winners, F.I.S.T., in the Campeonatos de Parejas Titles #1 Contenders Tournament. - CHIKARA Brick (November 17, '06) = Incoherence (Delirious & Hallowicked) took down The Order of the Neo Solar Temple (UltraMantis Black & Hydra). - CHIKARA Talent Borrows, Genius Steals (November 18, '06) = Incoherence (Delirious & Hallowicked) & Up In Smoke won over The Order of the Neo Solar Temple (UltraMantis Black, Blind Rage, Crossbones, & Hydra). - CHIKARA Anniversario! (May 27, '07) = Incoherence (Delirious & Hallowicked) defeated BLK OUT (Eddie Kingston & Ruckus). - CHIKARA Cibernetico & Robin (September 22, '07) = Incoherence (Delirious & Hallowicked) won a "#1 Contenders" Match over The Order of the Neo-Solar Temple (UltraMantis & Hydra). - CHIKARA Bruised (October 26, '07) = Incoherence (Delirious & Hallowicked) won the CHIKARA Campeonatos de Parejas Titles, winning a "Three Falls" Match over F.I.S.T. (Chuck Taylor & Icarus). - CHIKARA New Star Navigation (October 27, '07) = Incoherence (Delirious & Hallowicked), as the CHIKARA Campeonatos de Parejas Champions, defeated The Osirian Portal. - CHIKARA Battle Of Who Could Care Less (November 16, '07) = Incoherence (Delirious & Hallowicked) & Tim Donst took down BLK OUT (Eddie Kingston, Joker, & Sabian). - CHIKARA The Sordid Perils Of Everyday Existence (November 17, '07) = Incoherence (Delirious & Hallowicked) retained the CHIKARA Campeonatos de Parejas Titles, winning a "Three Falls" Match over Up In Smoke. - PWG Dia De Los Dangerous! (February 24, '08) = Incoherence (Delirious & Hallowicked) lost to the PWG Tag-Team Champs, the Dynasty (Scott Lost & Joey Ryan). - CHIKARA King of Trios Tournament '08, Night One (February 29, '08) = The Golden Trio (Incoherence [Delirious & Hallowicked] & Helios) received a bye in the first round of the King of Trios '08 Tournament, then beat Team IPW:UK (Martin Stone & The Kartel) in the second round. - CHIKARA King of Trios Tournament '08, Night Three (March 2, '08) = The Golden Trio (Incoherence [Delirious & Hallowicked] & Helios) beat The Fabulous Three (Shayne Hawke, Mitch Ryder, & Larry Sweeney), then lost, via DQ, to BLK OUT (Eddie Kingston, Joker, & Ruckus) in the semi-finals of the King of Trios '08 Tournament. Los Luchadores (Lince Dorado, Incognito, & Pantera) won the tournament. - CHIKARA Passion And Persistence (April 20, '08) = Incoherence (Delirious & Hallowicked) stayed the CHIKARA Campeonatos de Parejas Champions, winning a "Three Falls" Match over F.I.S.T. (Gran Akuma & Icarus). - CHIKARA Grit And Glory (May 18, '08) = Incoherence (Delirious & Hallowicked) kept the CHIKARA Campeonatos de Parejas Titles, winning over The Osirian Portal. - CHIKARA Aniversarioma! (May 23, '08) = Incoherence (Delirious & Hallowicked) & Claudio Castagnoli beat Shayne Hawke, Brodie Lee, & Mitch Ryder. - CHIKARA Young Lion's Cup VI, Night Three (June 15, '08) = Incoherence (Delirious & Hallowicked), as the CHIKARA Campeonatos de Parejas Champions, took down The Super Smash Brothers. - CHIKARA Tragedy And Triumph (July 13, '08) = Incoherence (Delirious & Hallowicked) retained the CHIKARA Campeonatos de Parejas Titles, defeating Buck Hawke & Mitch Ryder. - CHIKARA All That Glitters (August 9, '08) = Incoherence (Delirious & Hallowicked) defended the CHIKARA Campeonatos de Parejas Championship, beating The Sea Donsters. - CHIKARA Vanity And Violence (August 10, '08) = Incoherence (Delirious & Hallowicked) & Claudio Castagnoli took down Brodie Lee & The Osirian Portal. - CHIKARA Style And Substance (September 7, '08) = Incoherence (Delirious & Hallowicked), Helios, & Hydra defeated The Best Around & The Order of the Neo-Solar Temple (UltraMantis Black & Crossbones). - CHIKARA Laying In The Gutter, Looking At The Stars (September 21, '08) = Incoherence (Delirious & Hallowicked) lost the CHIKARA Campeonatos de Parejas Titles to The Super Smash Brothers. - CHIKARA The Global Gauntlet, Night Two (October 19, '08) = Incoherence (Delirious & Hallowicked) defeated The Order of the Neo-Solar Temple (UltraMantis Black & Crossbones). - CHIKARA Armdrags To Riches (November 16, '08) = Incoherence (Delirious & Hallowicked) lost a "Four Way Elimination" Match to The Colony (Fire Ant & Soldier Ant). The Fabulous Two and The UnStable (Colin Delaney & STIGMA) were the other participants. - CHIKARA Revelation X (January 25, '09) = Incoherence (Frightmare & Hallowicked) defeated The Roughnecks. - CHIKARA King of Trios Tournament '09, Night One (March 27) = Incoherence (Delirious, Frightmare, & Hallowicked) lost in the first round of the King of Trios '09 Tournament to The Masters of a Thousand Holds (Mike Quackenbush, Jorge Rivera, & Johnny Saint). F.I.S.T. (Gran Akuma, Chuck Taylor, & Icarus) won the tournament. - CHIKARA The Bobliographon (April 26, '09) = Incoherence (Delirious, Frightmare, & Hallowicked) took down Eddie Kingston, Brodie Lee, & Grizzly Redwood. - CHIKARA Hiding In Plain Sight (September 13, '09) = Incoherence (Frightmare & Hallowicked) defeated F.I.S.T. (Chuck Taylor & Icarus). - CHIKARA Chikarasaurus Rex: King Of Sequel - Night Two (July 31, '11) = The Spectral Envoy (Incoherence [Frightmare & Hallowicked] & UltraMantis Black) won over El Generico & 3.0. - CHIKARA Martyr Yourself To Caution (September 18, '11) = The Spectral Envoy (Incoherence [Frightmare & Hallowicked], UltraMantis Black, & Crossbones) beat Sinn Bodhi & The Batiri (Kobald, Kodama, & Obariyon).